See Bo Bice perform on "The Early Show". "Bo Bice belts 'em out on The Early Show Friday. 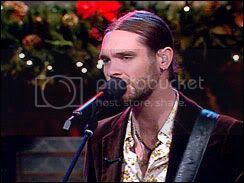 (CBS/The Early Show)"
CBS news confirms my good words in praising the "Merry Christmas Baby" rocking Yule tune Bo Bice belted out on "The Early Show" yesterday morning. This is your link to read their article complete with a link in the article, to play the appearance; in the event you missed it or just want to watch it through the this very cool Yule.